Are poor students… poor students? Wealthy families do not worry about food, or transportation, or whether walking to school involves crossing a gang boundary. How does poverty affect test scores? Who gets a free school lunch? How does race affect test scores? How do test score differences associated with poverty differ from those associated with race? What is the definition of poverty? How does poverty affect learning? They have shelter, and health care when they need it. If a crisis hits, they have savings to fall back on – or at least access to credit on reasonable terms. If you haven't lived in poverty, it is hard to imagine it. How does poverty affect educational results? Poverty correlates very strongly with academic results. Schools with low test scores nearly always have a lot of families living in poverty. Schools without a lot of poverty nearly always have good scores. This correlation is very stable -- the chart below shows scores on the NAEP test, highlighting Massachusetts (where scores tend to be better) and California (where they tend to be worse). The connection between poverty and academic results is one of the most enduring relationships in all of education research. For example, the gap shows up in the scores of the ACT tests students take as part of the college application process. In a 2015 chart from a multi-year study, ACT identified a set of benchmarks to compare how well students are prepared for college and career. 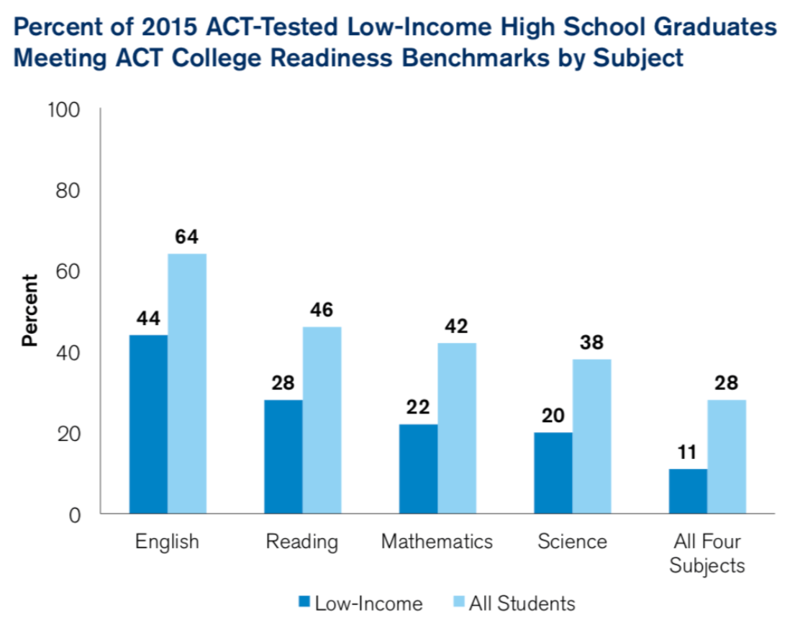 While 42% of students from families with incomes above $100,000 met all four ACT College Readiness Benchmarks, only 13 percent of low income students (under $36,000) did. In 2017 the gap showed up, as usual, in the results of California's annual standardized test, the California Assessment of Student Performance and Progress (CAASPP). About 2/3 of students from low income families did not meet grade level standards in English Language Arts/Literacy. For students not in low income families the ratio was flipped -- about 2/3 did meet grade level standards. The relationship to poverty is amplified at the extremes. For example, about a third of students from a family not living in poverty scored in the "exceeded standards" range. But only one in ten students from a low income family did so. Poverty statistics in education often rely on a crude definition of poverty: whether a student's family qualifies for the free lunch program. This is a useful distinction, but binary -- you either qualify or you don't. This leaves room for big differences. It's like calling both Tom Cruise and Danny Devito "short." Sure, neither should be cast as a star player in a movie about basketball, but they don't equally miss the mark. It is common to use the lunch program as a way of measuring poverty in schools. By this measure it appears that about half of California students are poor and the incidence of poverty has risen dramatically. But Matt Chingos of the Brookings Institution counsels that this rule of thumb is a myth. The rules for meal programs vary from one place to another, and even from school to school. Over time, the requirement to qualify for food aid have generally been made less stringent, which can create the impression of rising poverty even in places where it is declining. A growing number of schools simply provide lunch to everyone, eliminating the paperwork hassle and possible shame involved. To qualify for free or reduced-price lunch usually requires filling out some forms, a small but nevertheless important barrier. Not every child who theoretically qualifies for food aid gets it. Schools and districts in high-poverty areas put some effort into getting the paperwork filled and filed because there is significant money at stake: under California's funding system districts receive extra funding to support the education of students in need. Often discussions about the "achievement gap" center on differences in student achievement based on ethnicity. Poverty and ethnicity are strongly correlated in California, as they are elsewhere. African American and Hispanic students are much more likely to be poor and their parents often have less education than white and Asian students. The cost of housing has exploded in California, and wages have not grown as fast as the price of rent. The effect on families has been dire: poverty hurts kids, and an increase in poverty is correlated with all kinds of bad outcomes. Families living on the edge find it harder to provide their kids with good spaces and places to focus on learning. The chart above compares the "supplemental poverty rate" in each state. Statisticians prefer this measure to the conventional poverty rate because it is more comprehensive and meaningful. Click the chart to read more about it. Race correlates with test scores and other “outcome” measures (e.g. high school completion, college completion). The effects are not just attributable to poverty. Disaggregated PISA scores. Graph by Steve Sailer. 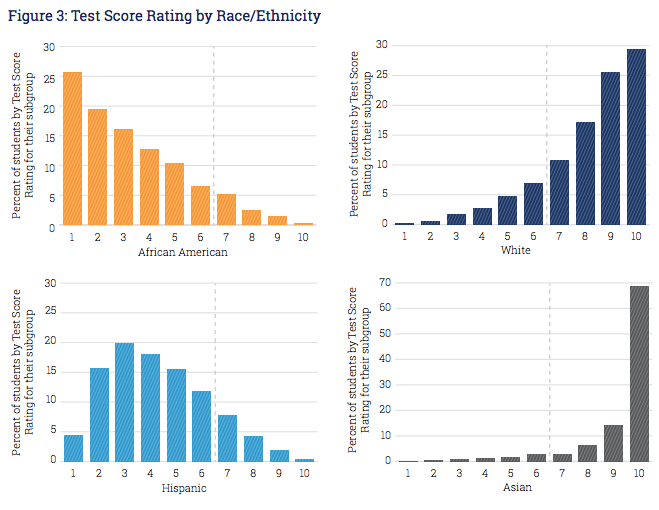 The graph above presents an unusual and controversial summary of international test data (the PISA test) that disaggregates American test scores by race. When viewed in this way, US test scores for each subgroup seem to “fit” with scores from other countries. This view supports the argument that US test scores have much to do with the history of American immigration. There are many theories about root causes of this correlation, some of them frankly racist. But racist theories of differences in student achievement collapse in the face of closer examination of facts. For example, a 2018 analysis points out that recent sub-Saharan African immigrants consistently out-perform other definable immigrant groups in measures of educational attainment. Scholars including Harvard’s Ronald Ferguson and Stanford’s Linda Darling-Hammond have tackled the complex issues of race in education. Some of the most frequently cited sources of patterns in the educational achievement of groups include hidden underinvestment; variances in family “social capital”; persistent cultural effects; and various effects of racism including race-based differences in expectations. "Only 2% of African American students and 6% of Hispanic students attend a high performing and high opportunity school for their student group, compared with 59% of white and 73% of Asian students." The GreatSchools report shows that few Latino and African American students attend schools where students like them score well. Few Asian or white students attend schools where students like them score poorly. Few, however, is not the same as none. The report goes on to identify 156 high-performing "spotlight schools" where African-American and Latino students score highly. These schools, half of them with relatively high poverty, show what's possible. He concluded that the score gaps associated with poverty were even bigger - and growing. In 2011, Stanford sociologist Sean F. Reardon compiled data to quantify the achievement gap between children from rich families and poor families. He concluded that the test score differences associated with poverty were considerably greater than those associated with race. He also found that the gaps are growing. John Scalzi, an author and social commentator, has suggested a provocative analogy to support discussion about the roles of race, gender, class and sexual orientation in education and life. He imagines a role-playing game in which character types have attributes that confer varying advantages and disadvantages. "In the role playing game known as The Real World," Scalzi proposes, "'Straight White Male' is the lowest difficulty setting there is." Writers and researchers take many approaches to exploring the patterns that connect with outcomes in education and life. Researchers differ in their definitions of poverty, and states have some influence over the definitions. For example, is a family counted as poor if it falls below a certain income level, or must it remain below that level for an entire year? What if it falls only a tiny bit below or above the line? The connection between scarcity and performance is phenomenally complex. Economics professor Sendhil Mullainathan has amassed evidence that scarcity itself taxes the mind. It's not just that bad decisions make people poor, this work suggests: "Instead, people make bad decisions because they are poor." Poverty creates its own negative feedback loop. Many theories of change in education seek to identify what combination of factors, in terms of students’ experiences both in and out of school, cause poverty and ethnicity to correlate so strongly with learning. Some of those factors are explored in the next few lessons. Updated April 3, 2017. Added chart comparing scores in California and Massachusetts. Updated Oct, 2017 with new CAASPP test results and new info about the hazards of using school lunch to measure poverty. Updated Jan, 2018 to incorporate information about African immigrant achievement and the GreatSchools "Searching for Opportunity" report. Updated Sep, 2018, adding video from NCES. The academic achievement gap between students from low- and high- income families has grown. Although race is strongly correlated with academic success, poverty has become even more important in statistical models of test scores. As someone who has had several Nigerian friends over the past several decades, grappling with the "sub-Saharan" cohort must be done. For example: Ms. Hendren's final sentences are not totally wrong and not totally true - although they sound great. Perhaps the way to see this most clearly is in the wonderful "Statistics" video which rings completely true; except for the comment on getting to school and maybe on words. I've never believed the "research" on poor people not hearing as many words, and I know what my Nigerian friends said about children getting to school. I'm a liberal in my beliefs, but I listen to my conservative friends. Yes, they are wrong on many points, but not all points - getting kids to school isn't totally a poverty problem. Please rework your explanation of the Scalzi video game analogy. Saying "character types have attributes that confer varying advantages and disadvantages," is implying that different demographics have intrinsic attributes conferring advantages and disadvantages, which sounds alot like racial inferiority theories. "'Straight White Male' is the lowest difficulty setting there is." Changing a demographic (race, gender, orientation) is analogous to increasing the difficulty setting on a game. YOU, the player, remain the same, but the way the game treats you, changes. Non-player characters respond less favorably, the game isn't dropping free boosts and bonuses everywhere, etc. The point is that members of different demographics are facing a harder game, not that their characteristics gave them disadvantages. Interesting information. Definitely poverty plays a big role in the gap in our students. Coming from a LATINO home and of low-income family this really hits home. Thanks for sharing. Should the rules regarding meal programs be the same for all? Where everyone fits into or out of the same scenario? This would cause more factual information to be able to be found, and with that, we can allocate funds appropriately to the schools that really do need it most, rather than to schools who claim they need more than others based off of their own requirements compared to other schools. How do we begin to fix this? Do we implement a statute that gives less income kids get extra help in school? Do we give more to help these kids? How do we close the achievement gap? It is very interesting to see the correlation between poverty and academic achievement, especially during the summer. I think that this calls for a year round school system. Before you come at me, year round school does not add any extra days of school, it only spreads summer break throughout the whole year. While this would certainly not address all the problems, however statistics show that summer break is harmful for all students. Perhaps less time to lose information could help lower the one and a half year gap between middle class and poor students. I learned from this article and the video that being family in poverty. or making a low income can't dictate your future. As a child it's your parents that need to develop these kids by getting them involved with activities or clubs so you become more educated and have a better chance to be in a better financial situation than your parents. There are too many kids around the world that are being born into a low income family, and it's hard for kids to later escape from that because they are as educated, and at the same time having little to no money. Overall, I think this was a very interesting article about the economics about the unfortunate truth about education in the U.S.
One of the statistics in the video that caught my attention was when he explained that Jamie (low income) has not been exposed to as many words as Jordan (middle income) and it could be as much as 30 million. The exposure to words was brought up at a Head Start conference panel I attended last year--the effect of minimal vocabulary is staggering. If we want to work towards closing this gap we are on the right track with providing free and reduced lunches but we need to provide more encouragement to our students of color and give them the help they need in order to be successful and the same for LGTB students as well. If a student needs an extra boost as a community it’s our job. We could have library’s available and close to low income students that provide WiFi and a space to do homework effectively. It’s a difficult task to try to solve this growing problem but together we can do it and I see a bright future for all children because we are recognizing the issue. It is very interesting to know that low-income directly relates to the challenges a child may face in school. If a parent is unable to provide their child with the care necessary for a child to fully develop, is that something that schools should offer? Specifically medical care such as doctor checkups and dentistry. If children are struggling to learn to read, should their be more programs to help them get caught up? As we consider the effects that poverty has on students performance in school we need to do more to even the playing field for students who may live in lower-income neighborhoods. The schools need help from the parents with reading skills this can be done by simply reading books to your child before bed at night to ensure that they are exposed to a wide variety of words. If we all work together to give children equal opportunities in school the drop out rate would decrease significantly. It’s heartbreaking to see that people learn less in school because of their social class and where they live. Race also correlates with the test scores being low and it’s just sad that we don’t try to help them and anyone in need of extra help. This lesson is extremely relevant in today’s society and I’m glad we are having a conversation about the correlation between poverty and education. I was especially intrigued by the fact that race does not have as large of an impact on achievement gaps as poverty. I’m alarmed by the inaccurate information that the PISA test presents to the world about US education. We are warping our data to cover up a problem, not okay. Poverty up until this point has had a cyclical effect on generations, rinse and repeat essentially. Legislators need to address the growing achievement gap, the problem isn’t going to fix itself. Kids in poverty do not have the same comforts that wealthy kids do. Imagine having to live in a hostile environment, not knowing when your next meal will be and trying to take school seriously. I know I would have a tough time. I agree with the statement saying that the definition of poverty is a vague term. Using a number to qualify the impoverished will leave some over qualified and others under-qualified. 4 easy steps for poor kids to do well in school with additions help? Doesn’t sound that easy with many constraints to low income families. I thought that this article was very informative. I learned a lot of new facts and statistics that I thought were interesting. It gave me a lot more insight about the topic. Everything in the article made sense to me. I can see how people living in poverty would have acccess to less resources that could influence the quality of their education. It's sad to see the differences in school performance based on race, but I think that's a harsh truth about society that we don't realize: factors including discrimination have led to certain races settling at the bottom of the class system. This feeds into the video in that it demonstrated solutions that society can/should adapt to in order to close up the gap in academics between races, ethnicities, and people in poverty. I am a true believer in you get what you worked for and some students in my school that are low income do not put in the work to get better grades. One of my friends who is low income has a supportive family at home and has all the resources he needs to do better in school but he just does not put in the work. I can see for alot of low income families that the stress of being low income can affect your grades. Although, there was a girl who lived in foster homes her whole life and when she finally got adopted into a low income family, she got a job as a janitor at her own school, took all advanced courses, and ended school with over a 4.0. She had managed to get good grades all throughout school. She is now a student at Harvard, with a full ride scholarship. I believe that if you really want to be successful in school, you will find a way to do it. I believe that it makes sense to question the definition of poverty. One can not simply define such a broad term by a person's income or where they live. I really liked the statistics about the PISA test and it’s correlation to ethnicity and country. I always wondered if there was a universal test that every country took to measure intelligence but never knew there was one until now. I believe that zip codes should not define how many educational opportunities are allowed for individuals. I believe that everyone deserves the same opportunity to education and advancements within the educational system. We make it nearly impossible for kids living in poverty to get out of poverty. If they had extra help and support from peers and teachers, or if we created more successful programs to help these kids learn and develop, they would be able to escape poverty and get good jobs. The poverty rates would go down. The facts displayed in the video were troubling about low income kids being 13x more likely to drop schooling. After school programs and summer day care provided by schools will help the summer gap between kids. And it's reassuring that schools are trying to make summer learning easier for lower income kids. Long video but loaded with unprecedented detail about the many, many poor families with young children in California and where and how they live. Lots of variation within the state. From PPIC. Education Commission of the States takes a look at "The Importance of At-Risk Funding" and reviews the methods each state uses to identify these students. The statement that caught my attention was: It's not bad decisions that make people poor but instead people make bad decisions because they are poor. I think you have the wrong definition of "middle class" in this segment. We are middle class and we DO NOT have any savings " to fall back on". Middle class is a number, not a set of circumstances. @langle: Like most terms in social science, "Middle class" has an evolving meaning. Here's what Gallup polls have to say about it: http://www.gallup.com/poll/182918/fewer-americans-identify-middle-class-recent-years.aspx . One main point of this lesson is that labels change and cut-points matter. I do agree with Jeff when he says, labels change and cut-points matter. We as a society determine and change labels all the time. and it continues however I can't say it affected my educational performance. This lesson was updated on April 22, 2015 to link to the fascinating evidence amassed by Harvard behavioral economics professor Sendhil Mullainathan of ways that scarcity impairs performance. He suggests that this negative feedback loop is a powerful part of the durability of poverty. The implications are significant: to improve performance, address the underlying scarcities. Poverty isn't even just about money. It is about the ratio of what people earn vs where they live and how they choose to live. I think schools should hold low income students to the same standards while providing support in terms of tutoring and reduced lunch programs. Unfortunately, many people take advantage of the systems in place. There is nothing wrong with being poor and as a teacher my BEST families were "poor". However, they were the ones that came in with an entourage of family members invested in the child's education. They demanded respect and discipline for their kids. They gave whatever they had extra for the classroom needs. The wealthier families rarely bothered to show up for conferences or events. POOR doesn't mean invaluable. Honestly the poorest people I know are the most willing to sacrifice. Because they value every dime they have. Poverty in the home doesn't necessarily translate to poverty in education. They may need more support, but teachers need to realize that they have just as much potential to learn as a wealthy student. If schools provided better education for all incomes then not as many people would fall into that category of being poor. Schools should all be ran on an equal level, because after all, all students need a proper education. Where you live should not effect the education you receive. Especially when there are programs like title I to help bridge the gap in funding. Another problem is the people who run our schools into the ground usually don't live in the area or send their kids to the schools they work at, why? They should have to so they can see the output of their actions. Then maybe they would bring the standards up. Hi, David -- Based on your comment, you will be interested in Chapter 5, which explores the "Places" where learning takes place. Chapter 5 also explores school choice. A new report, Double Jeopardy: How Third-Grade Reading Skills and Poverty Influence High School Graduation, from the Annie E. Casey Foundation finds that students who don't read proficiently by third grade are four times more likely to leave school without a diploma. For readers who can't master even basic skills by third grade, the rate is six times greater. The longitudinal study of nearly 4,000 students calculates high school graduation rates for children at different reading skill levels and with different poverty rates. Overall, 22 percent of children who have lived in poverty do not graduate from high school, compared to 6 percent of those who have never been poor. This rises to 32 percent for students spending more than half of childhood in poverty. Even among poor children who were proficient readers in third grade, 11 percent still didn't finish high school. That compares to 9 percent of subpar third grade readers who have never been poor. Graduation rates for black and Hispanic students who were not proficient readers in third grade lagged far behind those for white students with the same reading skills. The findings in the report suggest three environments where new policies and programs could foster children's school success: schools; family; and federal, state, and local policy. As we consider the role of poverty in shaping children's learning, it's key that we recognize the colorful variation found among families in California. Many display strong cultural and parenting strengths that do lift their children. On Latino children and schools: http://ewa.org (New Journalism on Latino Children).